Today, Bluecoats are excited to debut a brand new look and feel to the corps' brand image which inlcludes an update and redesign to the corps' Web site, logo and uniforms. In preparation for the grand reveal, DCI.org caught up with Bluecoats Executive Director David Glasgow to get some insider information on these upcoming changes. DCI.org: What does it mean that the Bluecoats are changing their brand image? David Glasgow: In "changing our brand image" we are changing our visual identity – what people see when they visit our Web site, view on our printed documents, purchase from merchandise line and even what they see when we perform. 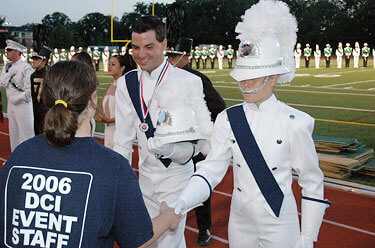 DCI.org: How would you describe the Bluecoats' brand image through 2006? DG: The one word that immediately comes to mind is "inconsistent." Over the years we have been very inconsistent in the use of our logo. Sometimes we used our "Bugle-B" logo on its own, sometimes the state of Ohio was behind it, sometimes the state of Ohio was silver, and sometimes it was red. One of our most important goals in this project was to make sure that from this point forward our new logo and brand image is used in very specific, consistent ways in very specific situations. DCI.org: What does it take to change the corps' brand image and what does changing that image include? DG: Our first step was to hire someone to develop the logo, the new font, the color scheme, and the "style guide" that defines how and when the logo will be used. After interviewing five potential candidates for this project, we decided to use Bradley Sexton, a freelance graphic designer from Chicago. With a background in the advertising industry, his list of clients includes Sony, Absolut, Disney, and the Miller Brewing Company. 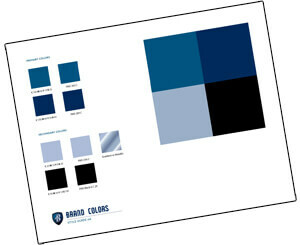 An elaborate style guide outlines the Bluecoats' new logo, including specified color schemes, fonts, and proper usage. Bradley's creativity and unique sense of style stuck out at us right away, and we were so impressed with his work that in addition to the logo and color scheme he has helped us develop new merchandise, new letterhead and business cards, new graphics for our trailers, our 2007 program logo, a trade show booth, our promotional mailings, and he even came up with the concept for our new uniforms. As you can see there are a lot of updates for us to make. 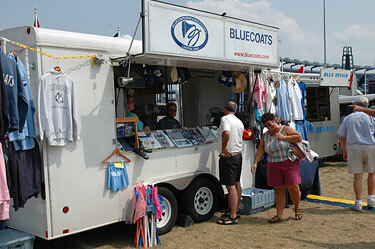 The corps' merchandise operation, as seen here in 2005, will have a face lift for 2007 offerring fans a chance to buy Bluecoats souvenirs with a new look. 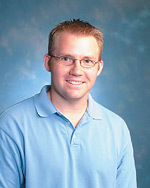 Bradley's work also influenced the design of our updated Web site, which was created by Bluecoats alumni Michael and Kim Connelly of Connelly Design Studio, a Web design company based in Gettysburg, Pa. DCI.org: How long have these changes been in the works? DG: We made the decision to overhaul our brand image in February of 2006, so this is well over a year in the making. With the most successful competitive finish in the corps' history last season under their belts, corps members will suit up this summer in new uniforms. DCI.org: The Bluecoats have been a really successful up-and-coming corps in the past few years, especially in 2006 when the corps ended the season with its best finish ever. Why does the organization feel the need to change the image at this point in time? DG: Thank you for the kind words about our recent success. I believe many of us have felt for a few years now that we've needed to update our off-the-field visual identity to more accurately reflect the level of sophistication we've been able to achieve on the field. We looked to 2007 and saw many opportunities to do a few things differently. We knew we were going to get new uniforms, we had a brand new trailer that needed new graphics, and we knew that we could possibly update our Web site. Because all of these things were happening in the same year, we felt the time was right to do something new and exciting. DCI.org: A central focus of this new brand identity for the Bluecoats seems to be centered around the organization's new logotype. The new logo is definitely a complete departure from the corps' traditional "Bugle-B." How long has that logo been used? DG: The "Bugle-B" logo, on top of the state of Ohio with the cursive script "Bluecoats" first came into use in the mid 1980s, and has been used in various ways until today. Side-by-side comparison of old and new Bluecoats logos. DCI.org: What does the new logo incorporate/represent? DG: We wanted something that represented our future while still paying homage to our past. Since we began as a musical outreach program of the Canton Police Boy's Club, we feel the shield – which is shaped like a police badge – in the background of the logo does a nice job of tying our new image into our history. The silver-metallic italicized "B" on top of the shield is meant to represent our future – modern, sophisticated, and forward moving. DCI.org: As the corps rolls out all of these changes just in time for the start of the 2007 season, how will this new brand image carry the corps through the summer? DG: We're hoping that the launch of the new brand image will help build some buzz and excitement around the corps as we enter into the beginning of the season. And of course stay tuned, as we will be unveiling even more exciting details in the coming weeks! DCI.org: How do the current corps members feel about these changes? DG: I first introduced this idea to our members on the final day of the 2006 season. Since then this project has been a hot topic of discussion for them, and for the most part, I think they are all very excited about it. Other than what they've seen released today, the only thing that's been unveiled to them is the new uniform. Their response to the new on-the-field look for the corps was awesome. They are very excited about what they are going to wear this summer! DCI.org: Has the new brand image influenced the 2007 show design? DG: Actually, yes. The darker colors of the new image influenced our decision to design a darker, edgier program. The "police shield" component of the new logo helped inspire the "CRIMINAL" show concept. Bluecoats' 2007 "CRIMINAL" logo foreshadows a dark and edgy look to the corps' program for this season. DCI.org: All things considered, what are the Bluecoats most looking forward to this season? DG: I think we're looking forward to continuing to improve on the field, and also traveling to the West Coast for the first time in the Bluecoats' history! In addition to seeing the Bluecoats' new look on the field this coming season, visit the corps' updated Web site at www.Bluecoats.com to check out the new logo and additional information from the corps as it is released.